Welcome to week 50 of the ‘The Desperate Housewife’s Quilt’. Todays block is about curved piecing from templates. Remember, this is not a quilt-a-long. Just follow the blog every week and pick and choose which blocks you would like to make. I will be injecting some uniqueness into traditional blocks, applique, three dimensional, crazy and thread-art blocks. If you make a block please post it on the Flickr group for everyone to enjoy. Also, I have this nifty button under each post that allows you to save the post as a PDF. This week will be chock a block with guests to make up the missing spots over the last 50 weeks. My first guest for this week is the lovely Tracey Rampling from The Peony Teacup. Tracey has created two blocks for me. Firstly, this gorgeous heart themed block – The Thrifty Housewife and secondly – Peach Blossom Perfection, made from 1″ hexagons. My third guest is Shirley Petersen who enjoyed making her first block so much she is back for a second. Shirley does not have a blog but her post can be found here – 4 patch fancy. Flick your hair in the slow motion and feel like a movie star. There are many methods to make templates and sew curves. Today I will show you one method which involves, freezer paper. If you don’t like sewing curves by machine, this block would be very easy to hand sew. Trace the template pieces on to the dull side of freezer paper. Cut out adding 1/4″ seam allowance all the way around. Using a warm iron, press the pieces onto the wrong size of fabric, trace around the template to mark the fabric and cut out piece. Remove freezer paper and clip sparingly the inside curves. (This relaxes the seam so it it easier to manipulate the seam when sewing the curved pieces together). Sew pieces, C,D,E,F,G, and H together. Sew pieces A and B together. 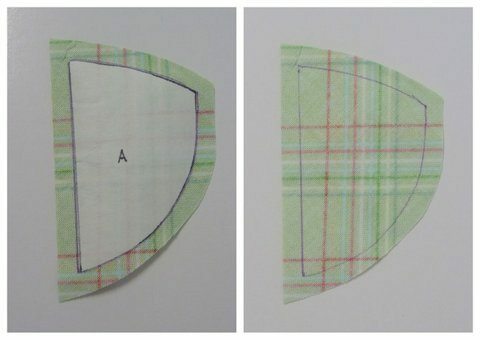 Here is a one video on how to do curved piecing. The web is full of great tutorials, so have a look around and pick one that is comfortable for you. The truth be told, I don’t pin and I use my 1/4″ foot for most curved blocks. I use my left hand to hold the top fabric and lift slightly and the right hand to manipulate the bottom fabric. I find that only doing a few stitches at a time and then readjusting works for me. I use a stiletto to anchor the pieces at the end where it can get a bit tricky. Don’t be afraid of the curve! If you think about it, a curve is a bent straight line. If you can sew a straight line, you can easily sew a curve. Just slow down and sew a few stitches at a time. If I am doing a whole quilt in curve piecing I will use the Curve Master foot. This is the final block in the series. I hope you have enjoyed the blocks as much as I have had making them. Over the next few weeks I will be posting the completed quilt. 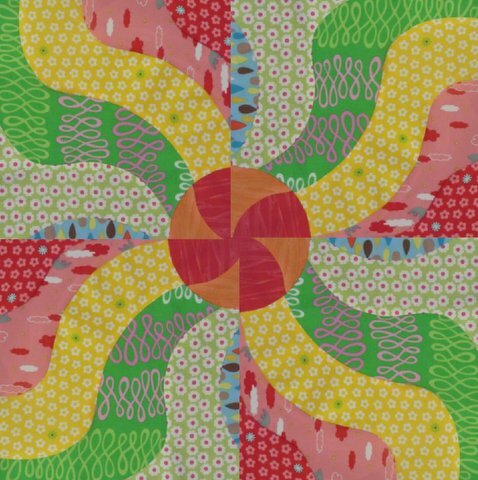 This will look so fun in the batiks I'm using for this quilt! So sad this is the last block, but now I don't have to feel so far behind 🙂 Thanks for this fantastic quilt block journey you've led us on, Jane! I've learned so much and can't wait to finish the quilt. Hi, Jane. This is a really neat block with the curvy lines. Lots of possibilities as you show so well. Love your color combinations–they have pizzazz! This is an awsome pattern, can't wait to get a few of them sewn together. Also, thanks so much for sharing your blocks and your talents with all of us out here in cyber land. I have so enjoyed each and every block and looking forward to making one amazing quilt.